If you were too late to buy a $400 round-trip flight to Milan last month, you and your passport (and a friend with a passport) are getting a second chance to score a deal. Emirates is now offering 2-for-1 summer flights from NYC to Milan, with two economy seats for $1,380, or two business class seats for $3,800. Which means you could live la dolce vita for as little as $690 per person, if you fly economy. Now, that might not sound super cheap -- it's no two tickets for $800, obviously -- but consider that it's on Emirates, and not some shabby, deal-buster airline. Emirates earns high marks in every conceivable category of service and amenities. Plus, Europe's the cheapest it's been in 12 years, and these prices are $100-200 cheaper than average -- especially for the high season. Take a look at a sample itinerary from a flex search on Kayak.com. If you're taking the plunge, you don’t have long to decide: The deal expires at 11:59pm on March 26, so you’ll want to hurry before all the cheap seats are snapped up. The deal’s only applicable for travel from JFK Airport to Milano Malpensa Airport between June 7 and Aug. 22 (though inbound blackout dates from June 27 to July 19, 2015 apply), and tickets are, of course, subject to availability. 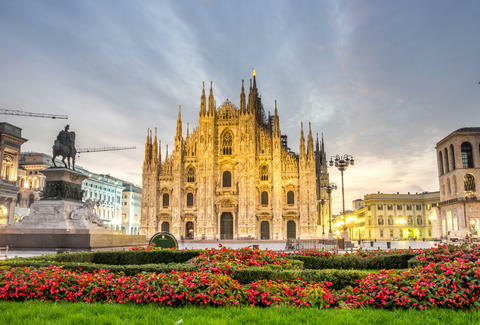 A few more things to bear in mind, from the small print: you must stay in Milan for a minimum of three days and maximum of three months; you have to book at least four days before you travel; and there’s a $100 surcharge per direction if you travel on a Friday, Saturday, or Sunday. 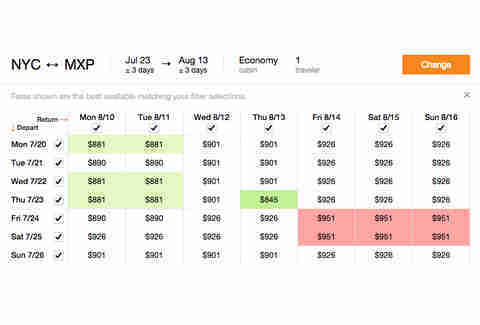 OK, weekday flights, but honestly, it's a pretty damn good deal. Now you're armed with your deal info. Go book your 2-for-1 tickets on Emirates’ website here.